JUBA, Feb 27 2014 (IPS) - Gatmai Deng lost three family members in the violence that erupted in South Sudan on Dec. 15 and lasted until the end of January. And he blames their deaths on the government’s failure to use the country’s vast oil revenues to create a better life for its almost 11 million people. 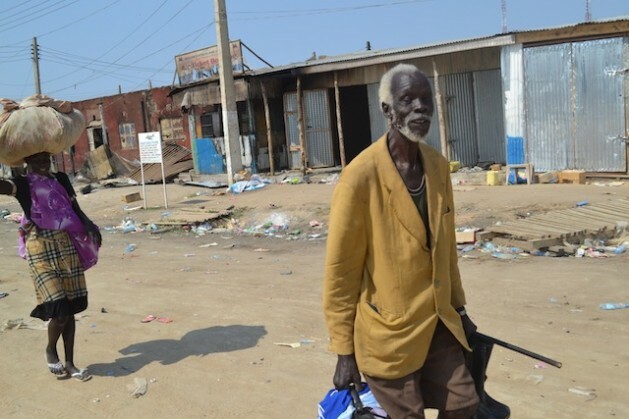 When the country gained independence from Sudan in 2011, many hoped that their new government would provide them with the services that successive Sudanese governments had denied the South Sudanese, Gatmai tells IPS. “But that government is no different from the Khartoum governments that marginalised South Sudanese citizens. Where are the hospitals? Where are the schools, where is the clean drinking water they promised us?” Gatmai asks. South Sudan earns 98 percent of its revenue from oil exports. Between 2005 and 2012 – when the country stopped production because of a pipeline dispute with Sudan – South Sudan earned more than 10 billion dollars from oil exports, according to both government and World Bank officials. When South Sudan resumed oil production in April 2013, the Ministry of Petroleum reported that it made 1.3 billion dollars in the first six months of production. But despite this, most parts of the country are inaccessible by road. So far, South Sudan has slightly more than 110 kilometres of tarmac roads in the capital, Juba. There is only one 120-kilometre tarmac highway linking Juba to the border with neighbouring Uganda. “I think the oil money is benefiting [President] Salva Kiir and his ministers,” Gatmai says from Khartoum, Sudan’s capital, where he sought refuge following the outbreak of violence in his country. The fighting left thousands dead and wounded, displacing 863,000 others. According to an interim human rights report released by the United Nations Peacekeeping Mission in South Sudan on Feb. 23, mass ethnic-based killings, gang rapes and torture were carried out by government troops and various opposition militia. Battles were fiercest in Jonglei, Upper Nile, Unity and Central Equatoria states. But analysts agree with Gatmai that the economic conditions here, characterised by high unemployment amongst the youth, an almost non-existent private sector and an over-dependence on the government as the biggest sole employer, may have contributed to the current conflict. Dr. Leben Nelson Moro, professor of development studies at Juba University tells IPS that oil has been more a curse than a blessing for South Sudan. Moro says once the violence started, “it became easy to recruit those who felt excluded from the country’s wealth into hostile activities. “A lot of the oil revenues were taken by a few people in positions of authority. Services were not provided to large sections of the population. We don’t have roads [and] we don’t have other basic services such as health care,” Moro points out. •	South Sudan’s agricultural sector employs 76 percent of the labour force. The sector contributes between 15 and 33 percent of national GDP. •	Only 12 percent of women and 11 percent of men within the active population are formally employed. “The revenues were not used to generate employment for young people. This generated some grievance against the few people in government who seem to be benefiting from the country’s resources,” Moro says. In practice, the government has no policy or strategy to increase the social economic integration of its youth. A large majority of the population relies on the agriculture sector for survival and employment. However, the government is the single biggest employer in the country. Badru Mulumba, editor of The New Times newspaper and a political commentator, tells IPS that it is this reliance on the government that led to the current conflict. “In this case politicians who found themselves out of power wanted to get back to positions of power in order to sustain their influence back in their communities,” he says. He explains that many ordinary, unemployed people looked towards their relatives in government being in positions of power as their source of income and livelihood. “If ordinary people had independent sources of income outside of the government, they wouldn’t have followed politicians who took up arms against those in power,” Mulumba explains. According to the World Bank’s African Economic Outlook for 2012, youth unemployment in South Sudan remains quite high. “Insufficient labour demand, lack of skilled labour supply, absence of a coherent government policy, and the lack of a sound legal and regulatory framework limit the absorption of youth by the labour market,” the document says. There are no official figures on the rate of youth unemployment but figures from Oxfam International show that only 12 percent of women and 11 percent of men within the active population are formally employed. The reliance on livestock by the country’s largest ethnic groups may have also contributed to the instability here. Both the Dinka and Nuer ethnic groups, among others, use cattle to pay bride price, pay compensation and penalties under customary law and even exchange cattle for food. “A large population of the country relies on a cattle economy, so people somehow accept this culture where you can raid cattle from the rival communities so you can accumulate more and become powerful,” Mulumba says. Between July 2011 and December 2012 alone, more than 3,000 civilians died in inter-communal fighting connected with cattle raiding in South Sudan’s Jonglei, Lakes, Unity and Warap states. Anne Lino Wuor, a legislator from the country’s restive Jonglei state believes that if leaders engaged young people and provided them with jobs, they would abandon cattle raiding. “I do think that the only way to bring stability and peace to South Sudan is through development,” Wuor tells IPS. Pinyjwok Akol Ajawin, director general for youth at the Culture, Youth and Sports Ministry, tells IPS that the country’s “youth got politically manipulated”. A National Youth Crisis Management Committee, a community service initiative for the youth, has been created with support from the government. “This is the only way to keep young South Sudanese busy and to discourage them from joining the ongoing conflict between government and anti-government forces,” Ajawin says. Edmond Yakani, executive director of the Community Empowerment for Progress Organisation, believes otherwise. “It is only thorough economic reforms that we shall bring stability to this country,” he tells IPS.